The acquired immune response or adaptive immune response operates through two types of cells specifically B-cells and T-cells. Humoral immune response is mediated by B-cells. B cells origin and maturation takes place in bone marrow. Each B cell has a unique surface receptor which is an antibody molecule. Later on activation this B cell produces the same antibody. 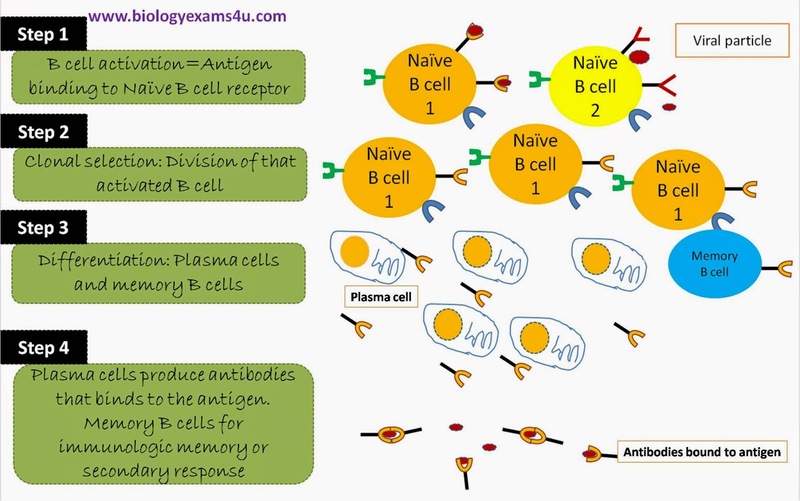 A B-cell that has not interacted with an antigen is called naïve B-cells. Step 1: When a naïve B cell interacts with an antigen specific for its surface antibody, it gets activated and starts dividing rapidly. The process is called clonal selection. The phenomenon of selective proliferation of B cells in response to their interaction with the antigen is called clonal selection. Step 2: Remember, B cell activation and proliferation depends on the cytokinins secreted by TH cells. In this interaction, B cells itself function as antigen presenting cells or APCs which present antigen on its surface Class II MHC molecules. This Class II MHC molecule with antigen on T cell surface interacts with T-cell receptor or TCR of TH cells. In addition CD40 of B cells interacts with CD40L of TH cells. This interaction activates B cells to differentiate and proliferate. 1) An antibody producing effector cells or plasma cells. Plasma cells do not have a surface Ig. Plasma cells secrete antibodies. A single plasma cell can secrete ~ 2000 antibody molecules/second. 2) Memory B cells which has long life span and possess a surface Ig and responsible for immunologic memory. Thus humoral immunity involves the production of antibodies by plasma cells and this constitutes the primary immune response. When there is an exposure to the same antigen second time, the memory B cells are alerted and rapidly differentiate into plasma cells that produces antibodies. This constitutes the secondary immune response.